A couple weeks ago a follower of our Facebook page informed us that there is a fallen soldiers memorial at the Popolopen Torne Trail in the Hudson Valley NY. Being that Ronny Ymbras (Author/Vietnam Vet) and I (son/author) are from the Hudson Valley we immediately became very intrigued and thought about visiting the memorial in the near future. So the message with our friend went back and forth and turns out the story is that the memorial is actually a large pile of painted rocks carried up the 5.1 mile trail and placed at the memorial site which looks over the majestic Hudson valley. Out of appreciation for the book Fallen Never Forgotten: Vietnam Memorials in the USA they offered to paint us a rock on one condition. We are up to the task! After we return from Washington DC for Memorial Day Ronny will add the names of the 13 members of his platoon and company that died during a friendly fire incident in 1968. These men were a large inspiration for creating the book in the first place. We will film the hike up the trail and share some amazing photos of this lesser known memorial in a very historic part of the country. Every year in late November, Americans no matter where they happen to be at the time celebrate Thanksgiving. The men and woman who served during the Vietnam War are no different, below you will find a collection of Thanksgiving Day menus that circulated during the war. We at Fallen Never Forgotten are thankful for another year shared with you all. Thank you for the enormous amount of support you have given us over the past year and we hope to continue our project and promote healing in the years to come. In the years passed since the Vietnam War ended, US citizens have sought to memorialize and honor those who never made it home. Across the country these tributes have been constructed and designed to portray the conflict and help the younger generations understand what these true american heroes have gone through. The following excerpts and photos are taken from the book Fallen Never Forgotten: Vietnam Memorials in the USA. The Ohio Veterans’ Memorial Park is located in Clinton, Ohio and is dedicated to the local heroes from each branch of the military who have served in both times of peace as well as war. It was created to help everyone remember that there are men and women who sacrifice themselves for the freedom of their country. The park is accessible seven days a week, 24 hours a day and is lit at night for the convenience and safety of the visitors. While visitors can come and go as they please, there are special events held at the memorial on days of remembrance. Veterans can also pay to have a piece of the memorial customized for themselves (families of fallen veterans can do this for their lost loved ones, too). Besides the Vietnam memorial, the park also holds other war memorials. The park itself was funded by donations from individuals, businesses, civic groups, houses of worship, and other organizations who were looking to thank the local veterans. Fundraisers were set up for the initial start of the memorial and continued through the construction of the monument. The Vietnam memorial was dedicated in 2009 following the dream of Ohio resident Dan Delarosa who was looking for a way to honor his brother who died during his tour in Vietnam. The main portion of the Vietnam memorial is the memorial wall. It is a 125-foot long black granite wall that features the names of the over 3,000 service members who lost their lives in the war. There is also an inscription on the wall that simply says “Lest We Forget.” Recently more casualties surfaced and will soon be added to the wall besides that the memorial is constantly evolving and has other components including a mounted helicopter and a military truck. There are plans to add a tank to the memorial, too. There is also a serene reflection pond dedicated to the prisoners of war and missing in action service members. This scene is made complete by a freestanding field cross. The Vietnam Veterans Memorial Park is the only state park in the country that is completely dedicated to the Vietnam veterans. The on-site chapel and visitor’s center offers educational resources as well as space for people to reflect on the sacrifice of all veterans in order to help people learn and heal through remembrance. This unique memorial came about due to the efforts of Victor and Jeanne Westphall. The two lost their son, Marine First Lieutenant David Westphall in May 1968 when his unit was attacked in Vietnam. They used David’s insurance policy to start the construction of the Peace and Brotherhood Chapel overlooking the Moreno Valley. This is the same chapel that stands in the Memorial Park today and is open to the public 24 hours a day. Since its dedication in 1971, the Vietnam Veterans Memorial Park was supported by the David Westphall Veterans Foundation. In 2005, the park became an official state park, but it’s still operated by the David Westphall Veterans Foundation in partnership with the Vietnam Veterans Memorial State Park Friends Group. Due to this partnership, the park is accessible without a fee to the public. The park has multiple features including the aforementioned chapel. There is also a visitor center that boasts a media room where an 86-minute documentary on Vietnam is shown. There is also a research library with photos of service members who died in action or who are still considered missing. On the site, there is also a Huey helicopter that was used in Vietnam. It was damaged during a March 1967 rescue mission and returned to the US for repairs. It ended up in the care of the New Mexico National Guard who donated it to the Memorial Park. In addition to these features, the park also houses a Doug Scott statue named “Dear Mom and Dad” as well as a model of the Vietnam Women’s Memorial that was dedicated in 1993 in the Washington Mall in Washington D.C. Visitors will also have access to the cemetery in the park, a water garden, and a memorial walkway. Memorial and Veterans day services are held here each year. The New Jersey Vietnam Veteran’s Memorial is located in Holmdel, New Jersey at the PNC Bank Arts Center. It is not only a memorial, it’s also a museum that attracts visitors from all walks of life. The museum holds exhibits coinciding with the memorial, including timelines of events that happened in both the US and Vietnam during the years of the Vietnam War and an exhibit of letters and photos sent home by veterans during the conflict. The memorial, like other monuments, was created as a way for the state to honor the local men and women who served bravely in the war. The memorial, which is outside of the museum, is accessible 24 hours a day, seven days a week with no fee. The Vietnam War memorial was complete on May 7, 1995, and was dedicated around the same time. It’s conveniently located on the grounds of the PNC Bank Arts Center (formerly known as the Garden State Arts Center). It was designed by a refugee from South Vietnam named Hien Nguyen. The construction was made possible thanks to a collaborative effort of individual donors, businesses, civic organizations, multiple New Jersey counties, and veterans’ groups. The cost of the whole project was estimated to cost around $5 million and was made possible through donations of materials and labor by generous private contractors. To offset the cost of the memorial, people were also able to apply their donation to either the cost of paving stones for the walkway or to the cost of one of the black granite wall panels. The memorial is expansive (it takes up 200 feet in diameter) and consists of different components. There is a retired 1964 Huey helicopter complete with two mannequins inside as well as functioning lights and speakers that play helicopter sounds. Surrounding the area is a granite wall made up of 366 panels in order to symbolize each day of the year. The wall features the names of local service members who passed on each individual day. In the middle of the open-air pavilion are statues honoring the veterans including the nurses of the Vietnam War. The sculpture made by Thomas J Warren consists of a wounded soldier reaching out for another soldier while a nurse tends to his wounds. This memorial hosts thousands of visitors per year including class trips, and a great turnout for the Memorial and Veterans day services. The Kentucky Vietnam Veterans Memorial is located in Memorial Park overlooking the state Capitol in Frankfort, Kentucky. It was created to honor the men and women who served the nation during the Vietnam War. The memorial is always open to the public and is one of the most visited sites in the state, but there are certain days where visitors can check out special ceremonies. The Vietnam memorial plays host to these ceremonies on Armed Forces Day, Flag Day, Memorial Day, POW/MIA Recognition Day, and Veterans Day. The Kentucky Vietnam Veterans Memorial was made by Helm Roberts who was not only an architect but was a veteran. Construction of the project began in November of 1987 and was completed by the summer of 1988 and ready for its dedication in November of the same year. The Vietnam War memorial is made of 327 cut granite panels from a quarry in Georgia that weigh over 215 tons. The names featured on the stones were etched using the same lettering that appears on grave markers in Arlington National Cemetery. This memorial is set up to resemble a sundial and features the names of the 1,104 Kentucky citizens who passed in the Vietnam War. The names were placed in a way so the sundial’s shadow highlights the veteran’s name on the anniversary of their death. In addition to this, the sundial points to the inscription “Greater love hath no man than this, that a man lay down his life for his friends” at exactly 11:11 a.m. on November 11 each year. The memorial also features the POW/MIA flag, the American flag, and the Kentucky state flag flying over the monument. The Community Veterans Memorial is located in Munster, Indiana’s Veterans Park. The park is six and a half acres large and features multiple monuments and sculptures representing the multiple wars and conflicts that have happened across the 20th Century. It was created in order to remember all of the service members who participated in the wars, including the Vietnam War. The committee who put the park and memorials together also want to educate the visitors about the downsides of war instead of glorifying the heroics of war. This is done as a way to try and stop the cycle of war and make room for peace. The park is open from dawn to dusk and is free to the public, but there are special events held at the location. There is a Veterans Day ceremony every year as well as a Pearl Harbor Remembrance ceremony in the park. Following the vision of Edward P. Robinson, the park memorials, including the Vietnam Memorial, was made by Julie Rotblatt-Amrany and her husband Omri and made possible through the efforts of Robinson and the Veteran’s Committee. The park as a whole was dedicated officially in June of 2003 but was commissioned to the Rotblatt-Amrany pair in 1999. The Vietnam Memorial is made up of multiple components and is made in a way to recreate the Vietnam War from the ground up. The artists recreated the rice paddies of Southeast Asia and set up their monuments within the recreation to make everything look more realistic. There are seven monuments set up throughout the Vietnam Memorial site which is linked to the other war memorial sites by a commemorative brick path that is made up of donated/sponsored bricks. The memorial consists of a retired Huey helicopter sitting in a rice paddy, a map of Vietnam etched into granite with images of the war, three sculptures of M-16s with flowers sticking out of their barrels positioned on a stack of bricks, a wall sculpture depicting a nurse with a wounded soldier, a recreation of a Buddhist temple in ruins, and two bronze sculptures. One statue is a depiction of a creeping soldier with his weapon in his hand while the other, more somber statue, is that of a fallen combat soldier who is lying face down on red stones; his legs are missing. The traveling Vietnam Wall Memorial making it’s way across the country allows veterans to remember their fallen brothers. Learn more about the project here. Visiting the Vietnam Veterans Memorial in Washington DC is a truly unique experience. No matter the hour, day, season, or year people read the wall, touch the wall, honor at the wall. Yet not everyone has the means or ability to visit this powerful monument. They don’t get the chance to pay tribute to U.S. soldiers who lost their lives during or because of the Vietnam War. To solve that problem, the American Veterans Traveling Tribute (AVTT) created the Traveling Vietnam Wall. It’s a remarkable replica of the memorial in DC. In this way, tens of thousands more people can pay their respects to those who perished and honor everyone who served in Vietnam. There are a few organizations that take replicas of the Vietnam Wall across America. But the replica created by AVTT is the largest and most visited. At 80% the size of the original, this traveling Vietnam Wall comes as close as possible to duplicating the experience of visiting the permanent memorial. The replica is 360 feet long and 8 feet tall at its apex. Panels with information about the original memorial and a timeline of the Vietnam War help visitors deepen their understanding of what they are experiencing. At many events, there are books and computers for you to look up names and their location on the wall. The replica is typically set up for multi-day events arranged months in advance. Check the complete schedule to see when the traveling memorial will be near you. The replica wall has every name on the original. It’s difficult to imagine the scope of loss of life until you see all the names in one place. If you took three seconds to read each of the approximately 58,300+ names inscribed, it would take over 48 hours to read the entire wall. Visiting the replica Vietnam Wall is valuable opportunity to share recent history with young people. It’s a bold reminder of courage and sacrifices made. For families who lost loved ones during the Vietnam War, experiencing the memorial and bearing witness to names that won’t be forgotten, can be comforting and restorative. Veterans of the Vietnam and other wars often find healing in visits to the replica monument. It — and the events around it — are important acknowledgments of service. Paying tribute at the Traveling Vietnam Wall is one way to show ongoing support for the men and women in the U.S. military. Monuments with the names of the fallen help promise that an individual life won’t be forgotten. Our book, “Fallen Never Forgotten: Vietnam Memorials in the USA” has a similar goal. Through photographs and detailed listings of names by state, “Fallen Never Forgotten” has become a guide to monuments across the country. The book is for veterans and their families. It offers a chance to visually visit honorable memorial sites, find information, and read the names of those who didn’t return home. Check out the reviews and get your copy today. What Happens to the Vietnam Veterans Gifts Left at the Wall? It’s common to leave small tokens and Vietnam veterans gifts at the memorial wall. But what happens to them at the end of the day? Take a look to find out. The Vietnam War was a time of extreme unrest, division, and tension in the United States. For over a decade, the country stood divided as more than 58,000 troops went missing or fell to the war effort while many more still fought for survival. The effects of the war lingered long after the ceasefire, and some conflict over the matter still exists today. One thing much of the public can agree on, though, is the feeling of community, respect, and support felt at the Vietnam Veterans Memorial. Every day, Vietnam veterans gifts line the wall. They range from flowers, notes, lost belongings, and more. To understand the impact and importance of the gifts, we are walking you through the history of the wall and where the gifts go once collected. The wall was dedicated on November 13, 1982. It was the result of three year’s work of the Vietnam Veterans Memorial Fund, in the hopes of beginning the healing process for the American public. More than $8,000,000 was raised by the American public and over 1,400 design ideas were submitted to VVMF. Today, the wall is like a “park within a park“. It stands as a series of polished black granite panels with over 58,000 names. Each name is etched in chronological order according to casualty dates, a gesture to represent the war as a timeline of individual sacrifices. Every day, Vietnam veterans gifts line the wall. In the early years of the wall, many items left behind could be tied to fallen heroes. They were things brought by family members or close friends; things that distinctly tied those in mourning to the people they were remembering. Some items included personal notes and letters, dog tags, pajamas, and of course, American flags. It is still common to see old pictures of those who went to war or flowers to honor their memory. Sometimes you see items connected to current events. Graduation tassels, drawings from grandchildren, teddy bears, cards, and bullet casings are there, too. There are also small items like packs of cigarettes and bottle caps. By far, the largest item left at the wall was the Harley from Wisconsin in 1995. It was a gift in memory of the 37 soldiers from Wisconsin who didn’t make it home. Every day, the Vietnam veterans gifts are collected by National Park Service. Rangers store everything in boxes, which are then placed in a temporary storage room in the Washington Monument. The final destination is the Museum Resource Center – the holy grail of 40 historic collections under National Park Services. There, the gifts stand amongst Clara Barton’s furniture and Frederick Douglass’s piano. Everything is cataloged and stored in acid-free boxes kept in temperature-controlled rooms. They are, after all, national treasures. The gifts are a phenomenon no one expected to happen. It wasn’t part of the plan, but the collection of over 400,000 items left behind has helped bring the nation together. The Vietnam Veterans Memorial Fund has recently announced plans to open a virtual collection of items left behind. The collection will be hosted at an education center with roughly 4,000-6,000 items. To learn more about Vietnam Vvteran memorials and the names of those who made the ultimate sacrifice, order your copy of “Fallen Never Forgotten”, today. Leave a comment on What Happens to the Vietnam Veterans Gifts Left at the Wall? With more than 4 million visitors each year, the Veterans Memorial is a tribute to those who fought in Vietnam. Here are 5 lesser known facts you need. The Vietnam Veterans Memorial, located in Washington D.C., was revealed on November 13, 1982. The monument is a one-of-a-kind commemoration to those we’ve lost. The memorial includes the names of more than 58,000 U.S. soldiers who perished during the Vietnam War. At the memorial, you won’t find patriotic or heroic symbols. There are no flowing flags or bald eagles. Instead, you’ll find a somber memorial that is simplistic yet striking. The black granite is a stark contrast to the commonly found white marble statues. The aura surrounding the memorial is quiet and reflective. Are you one of the 3 million people who visits the memorial each year? Do you think you know everything there is to know about the memorial? We’re here to shock you! Here are five lesser known facts about the Vietnam Veterans Memorial. Unlike most memorials, no government funds were used to build the memorial. The idea of the memorial came from Jan C. Scruggs, a wounded Vietnam Vet. In 1979, Jan used $2,800 of his money to create a fund for the memorial. Legislation was passed to remove existing structures to make room for the memorial. Eventually, the fund raised more than $8.4 million. With those guidelines, the fund opened a design contest. More than 1,400 memorial designs were submitted. The winning design was anonymously submitted by a 21-year-old college student at Yale University. The winner, Maya Lin, has designed other notable memorials, including the Civil Rights Memorial. The Veterans Memorial is not as simple as it looks. The memorial contains two walls, both of which are 246.75 feet long and 10.1 feet high. Together the walls form a 125-degree angle. The western wall points towards the Lincoln Memorial. The eastern wall points towards the Washington Monument. The walls are made from black granite. Each name on the memorial has a diamond or a cross. A diamond represents that the military member died in action. A cross determines that the person is still missing in action. When the memorial was first created, it included the names of 57,939 American military members. Almost three decades later, the number of names has jumped to 58,318 as of 2017. Names can only be added to the memorial when it’s been determined that a veteran died because of the war. Criteria mandates that postwar casualities are honored with a plaque versus an inscription on the memorial. Want to learn more about the Vietnam Veterans Memorial Wall in DC? Looking to boost your knowledge about other lesser known Vietnam memorials? If so, now is the time to pick up Fallen Never Forgotten. The book, written by Ronny Ymbras, provides in-depth knowledge about the various Vietnam War memories within the United States. 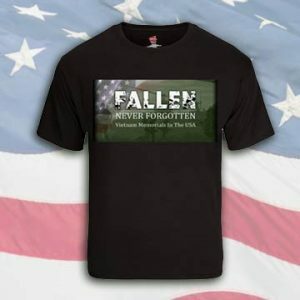 Fallen Never Forgotten covers more than 50 memorials and includes professional pictures of each one. Ready to purchase? If so, do so below! Veteran’s Day means a different thing for each of us. For some, it reminds you of the time you were in service. To others, the day allows them to appreciate their sons, daughters, mother or father for their active duty and service. As a country, it helps us appreciate and recognize the efforts and courage of our military members in their effort to create a peaceful and safe world for all of us. With Veterans Day gifts and gestures you can show your appreciation to our service men and women. activities to engage with veterans and learn more from their stories and experiences. Also, it offers a good opportunity for you to expose your kids to the holiday and help them learn more about the military and its role in our country. Attending the Veterans Day events is fun and helps to bring people together to share their wartime stories. This can make it easy to forget the cost of war. On the Veterans Day, you can choose to visit a VA hospital to donate or help with simple tasks such as washing and cleaning. A visit can help to brighten an ill person’s mood and give them even more courage than they already have — especially those suffering from severe injuries. Remember to bring your kids with you. A simple thing like letting a veteran share his or her service experience can make one of the best Veterans Day gifts. ALthough some veterans do not like to talk bout certain things, especially in detail, many do, And some feel it helps them to talk about things and let out their feelings. Some people find joy and comfort in telling others the difficult, memorable or exciting experiences they had in the military. You just never know how much it means to them. Remember you can also carry a small gift as a way of thanking the veteran for their time such as a coin, book or other item. There are plenty of organizations that support veterans to make their lives better. Such organizations will appreciate any kind of donation that will help them sustain their course. Donation can be anything. You can donate your time to volunteer at the organizations and help where necessary. Money donations are also great if you don’t have time to visit VA organizations. Do you have an old truck, car or RV? Donating it is the best way to get rid of it. If you’re looking for a creative gift for a Vietnam veteran, books offer a unique way of showing your appreciation and gratitude to the special veteran in your life. In this case, you want something meaningful that they can relate to. For those people with Vietnam veterans in their lives, a book, such as Fallen Never Forgotten, provides all you need to make their day. The book covers 50 memorial sites in detail featuring over 350 professional photographs of the memorials, one from each state. They also included information about who put in the effort to make the memorial a reality, when it was dedicated, how to get there and the best times of year to visit. Each state’s chapter is topped off with the state level list of the names of those brave men who gave their lives for their country. Also known as “The Vietnam Veterans Memorial Book”, Fallen Never Forgotten honors those who never made it home and acknowledges them for their ultimate sacrifice. There are so many ways to appreciate veterans and service men for their dedication to military service. Whether you have a family member in the army or not, it helps to be part of the celebrations by doing something to honor them for their bravery. Association was another success. The turnout was a good one even as early showers turned into bright sunshine. After posting colors Bob Maslo gave a touching reading of a poem from a military graduate to his military father. The grounds are a real testament to the heroes that are honored here. A 360 degree Black Granite circular wall with slabs for each date memorializing the soldiers from the state of New Jersey who dies on that day. The bronze sculptors are of a fallen soldier, a nurse and a helpless comrade looking on. The other statues are of the War Dogs who served and the Gold Star Mothers. On thing that sets this Memorial apart from many others is the Education Center which houses a Vietnam War timeline second to none. It covers the war on the battlefield and what was going on at home. The well put together piece starts from before the US involvement until the communist takeover in a large circular building with a fine gift shop.